Many people have found their way to Avatar Adi Da Samraj over the past few decades since He formally began His Work in 1972. The stories of how they found Him are moving and often extraordinary; these stories tell how they finally found what their hearts were seeking. It was only then that the real adventure of their life in God could begin for real. Here are a few stories from some devotees in our "Greater DC" community (from Florida to Pennsylvania). We hope they will inspire you to get to know Adi Da Samraj better yourself! Maksim Igorevich Rykov  "The moment the video started, my heart was broken by the immensity of Divine Force emanating from Him. I wept and wept, my body radiating with His Spiritual Transmission. . . The Divine Love I felt was the Perfection of God that I had only read about but never thought possible to experience while alive." Neeshee Pandit  "I was sitting at home one day in such a state when a remarkable event occurred. An unbelievable Energy descended upon me and I began shaking. Its Thickness enveloped my entire body and it was vibrating with an unspeakable intensity. 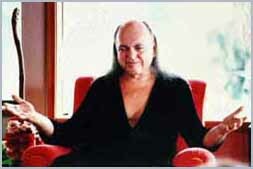 I swooned in ecstasy. . . . Adi Da's Spiritual Invasion of the body-mind is Satisfaction, Happiness, and Love.". Marian Roscheck  "My life has had many difficulties and sufferings But those bindings and sufferings of terrible limitations have been loosened in feeling and knowing the true Spiritual Heart-Master, Avatar Adi Da, who is not an �idea� or a �belief� � but a living, all-revealing Person, beautiful in form, all-loving in His God Nature, profoundly beyond any of our mind-explanations." Jackie Harwood  "In the days and months to come, I could not stop picking up these books and many others by Adi Da, and every time, the deep feeling of heart happiness arose to the point I was ecstatic with joy. Here was a being who knew my heart urges completely, who drew me into an understanding of life and the Divine that I only suspected actually existed." Michael Dustrude  "Looking back over my life as His devotee and all that He has given�all so starkly evident now, especially in this new time following His Divine Mahasamadhi�I realize what a divine gift The Method of the Siddhas was, placed in my path 35 years ago, and that the $3.95 I paid for it was a sacrifice, but only of ego�into the Divine. ".